Johnson waged a bloody, budget-busting war against Soviet proxies in Vietnam. Most recently, it became the turn of President Barack Obama. On July 17, 2014, Malaysia Airlines Flight 17 MH 17/MAS17 took off from Amsterdam for Kuala Lumpur International Airport. But as the flight–and its 283 passengers and 15 crew—cruised above Hrabove in Donetsk Oblast, Ukraine, Russian-backed Ukrainian separatists shot it down. A Buk surface-to-air missile slammed into the aircraft, almost instantly killing everyone on board. But now the United States has a Republican President who has cozied up to Putin since he entered the 2016 Presidential race. In January, the CIA, FBI, NSA and the Office of the Director of National Intelligence concluded that Russian Intelligence agents had meddled in the election via cyber-warfare to secure Donald Trump’s election. Yet, at the G20 summit, Trump declared it was “an honor” to meet Putin. Yet America’s frustrations with Russia generally—and Putin in particular—long predate those of Barack Obama. 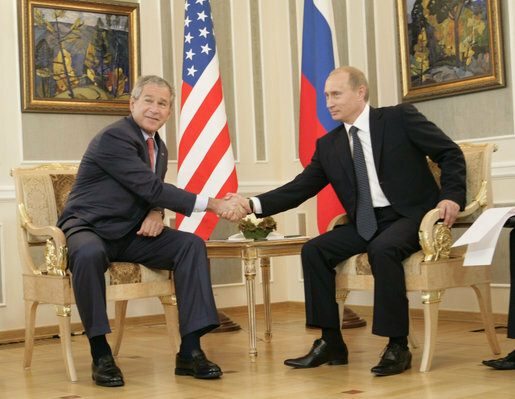 Nor were relations between the United States and post-Soviet Russia helped by the naivety of President George W. Bush. In June, 2001, Bush and Putin met in Slovenia. During the meeting a truly startling exchange occurred. Putin instantly sensed that Bush judged others–even world leaders–through the lens of his own fundamentalist Christian theology. Of course, no one from the Right is now recalling such embarrassing words. It’s far more politically profitable to pretend that all of America’s tensions with Russia began with the election of Barack Obama. And to pretend that those tensions have vanished now that another Right-wing President occupies the White House.